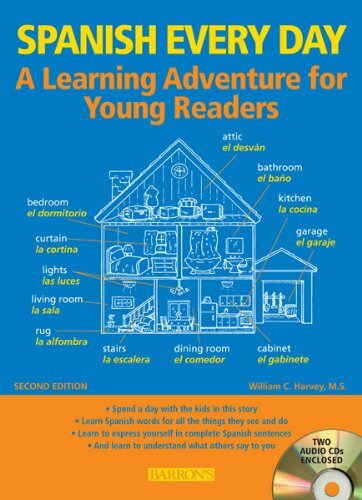 This informal text, accompanied by more than 400 cartoon-style illustrations, is designed to teach the basics of practical conversational Spanish to all family members, with special focus on instructing younger children. The book recounts a typical day in children's lives, starting as they wake up in the morning and concluding at their bedtime. The illustrations on every page reinforce vocabulary retention and clarify word meanings. Boys and girls pick up new words, phrases, and language skills as they follow a day's events, starting in their bedrooms (toys, clothing, numbers) and moving through the house (names of family members, rooms, furniture). In the kitchen they learn Spanish words for appliances and food. Once outside, they walk along the street and pick up words for workers, cars, trucks, buses, and more. At school they learn Spanish words for objects in the playground and inside the classroom. Back home again and ready for dinner, they learn more Spanish words until bedtime. This new second edition includes expanded vocabulary and replaces the first edition's 90-minute audiocassette with two enclosed audio CDs. The compact discs complement the book's story line and familiarize kids with the sound of spoken Spanish in conversational settings. Here is a handy language program for self-learning at home, or for use as a supplement to classroom instruction.